is proud to offer a high quality system that can improve your family's quality of life by supporting healthy living. Designed to meet the needs of any household, this DIY Reverse Osmosis System offers a safe, effective, and easy-to-install means of purifying tap water. This technologically advanced water filtration system uses a reverse osmosis process to concentrate impurities and dispose of them: resulting in healthy, fresh-tasting drinking water. The heart of the Aqua Rich System is a Reverse Osmosis Membrane with 0.001 micron precision filter - it removes bacteria, heavy metals, salt, detrimental mineral substances, dissolved matter, and chemicals that are found in tap water. This Reverse Osmosis filtration unit has many health and environmental benefits but it is also very helpful for those families watching their budget. Economically-minded households can have a constant flow of quality water while saving nearly $400.00/year just by replacing bottled water with filtered water. "Here at DYReverseOsmosis.com we are here to provide you with a complete reverse osmosis water filtration kit that you can install with minimal effort. This kit includes all the necessary filters, water tank, color coded tubes, t fitting with ball valve, drain clamp, wrenches, mounting hardware and pedestal faucet. The AquaRich reverse osmosis filtration system has 5 levels of filtration. The first level of filtration is a simple spun filter that is designed to contain large sediment debris in your water supply. This stage filters out large contaminants such as dirt particles and dust. The next level of filtration is a granular carbon filter that helps remove chlorine, odors, turbidity, and organics. The water is then fed into another carbon filter, a solid carbon filter, that removes any remaining chlorine, odors, and organics. The job of these filters is to protect and extend the life of the reverse osmosis. The reverse osmosis filter is intended to remove bacteria, heavy metal, salt, detrimental mineral substances, or other dissolved minerals and chemicals. The filter screen opening on the reverse osmosis filter is only 0.001 microns, which only allows water molecules and the occasional gas molecule. To remove any remaining contaminants in your water, there is a post carbon filter. This filter is used to remove any contaminants left in the water and help improve taste and quality of the water. By using a AquaRich Reverse Osmosis Filtering System you can nice pure water that will great for baby formula, cooking, drinking, and for coffee and tea. The pure water will make sure your drinks and recipes will taste great, because impurities in the water can have a damaging effect on the taste of various drinks and recipes. One unique feature of the AquaRich reverse osmosis filtration kit, is that the reverse osmosis filter will purge any contaminates to help extend the life of the filter. As the water travels through the filtration system, it can either exit out the pedestal faucet or be stored in the provided water tank. This tank can contain 3.2 gallons of water. The water enters the tank just before the post carbon filter, but once you open your faucet the water will travel through this last filter. This kit was designed with the DIY installer in mind. Each water connection on the AquaRich reverse osmosis water filtration kit is color coded with the corresponding water tubing. The connections are color coded right out the box, and this is to ensure the ease of installation. The instruction manual has a color installation of the tubes to make this even simpler of an install. The AquaRich Reverse Osmosis Filtration kit comes in 3 different versions from DIYReverseOsmosis.com. You can either choice from a 50 gallons per day (GPD) filtering system, 100 gallons per day (GPD) filtering system, or a 50 gallons per day (GPD) system with a built in pump. The regular 50 GPD and 100 GPD filtration kits are exactly the same, with the only difference being the size of the osmosis filter. The larger filter allows your system to filter more water continuously. The filtration system with the built in pump is designed for remote locations or if you are using a well for your water supply. In regular applications the built in pump is not needed The reverse osmosis water filter requires about 85 psi to filter out any microscopic contaminants and this pump is in place to help bring the pressure up to recommended level. When you order from DIYReverseOsmosis.com you will also have the option of upgrading your pedestal faucet to one of our optional faucets. You will choice to upgrade to one of our 3-petal faucets with either gold trim or chrome trim. In addition to these options, we also offer a filter replacement plan. Depending on your usage levels we will ship you out replacement filters corresponding the manufacture's recommended schedule. This plan includes the replacement of all 5 filters. This helps cut down on the cost of filter replacement by spreading the costs outBy enrolling in this plan at the purchase of your AquaRich Reverse Osmosis Filtration System, you will be eligible for an instant $100 rebate off the purchase price your kit. DIYReverseOsmosis.com was designed with the DIYer in mind. We have installation and technical support 7 days a week from 9 am to 9 pm, Eastern Time. Please gives us a call, send an email, or use our live chat and we are more than welcome to answer any questions you may have." What? The Filter Plan automatically charges your account on file and sends out the necessary filters when you need them (one to two filters every few months). Why? With each our filter plans the cost per filter is significantly less than purchasing them individually. Also, there is no need to remember when it is time to repurchase and also prevents over purchasing for lower usage households. How? Just select your family size to determine the correct frequency of filter shipments to keep your water clean and loved ones healthy. Water recovery percentage: 92% to 99% depending on incoming water quality. The R.O. machine works to remove fluoride, a chemical additive that is found in most municipality water systems. The usage of fluoride in water (referred to as fluoridation) has been the source of contention and debate regarding its health benefits. 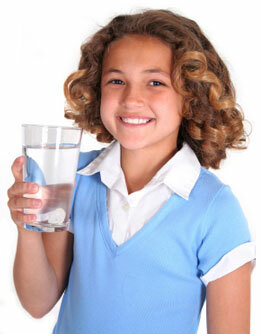 Most people are aware that tap water still contains contaminants and that it should be further treated before drinking. But how much of a difference does it really make? Filtration removes lead, chlorine, and bacteria, all of which are harmful to the body, inciting disease and even affecting cells on a molecular level. Chlorine especially can cause various cancers of the digestive system, and filtered water can reduce this risk. Similarly, filtration units can eliminate chlorine-resistant bacteria, which are not eliminated at municipal water treatment plants because the process there relies on chlorination of the water. Filtered tap water also provides clean water for cooking. How many people put tap water ice cubes in their favorite drink? The contaminants are still present, but a filtration unit would ensure clean water in all situations. Clean water is exceptionally important for children whose immune systems are still developing and cannot combat the toxins and contaminants potentially present in drinking water; filtration can remove the 2,100 known toxins that can be found in drinking water. In fact, the EPA notes that lead in drinking water may contribute to learning disabilities in children. They also note that toxins in drinking water can lead to birth defects when consumed by pregnant women. Home filtration allows the water to be cleaned at the point of use. When water is treated in a municipal water plant, it may have hundreds of miles of pipeline to travel through before it gets to your faucet, all the while picking up contaminants present in the pipelines. Reverse osmosis water treatment was developed more than 40 years as a means of creating clean freshwater from saltwater. It was recognized as a viable alternative to expensive and energy wasteful water treatments, and produced for home use. Osmosis is the process by which water will travel through a permeable membrane in order to balance salinity on both sides of the membrane. Reverse osmosis forces water through the permeable membrane in order to create a solution of fresh water on one side, and a saline solution on the other. This membrane also removes lead, manganese, iron, calcium, fluoride, and other contaminants with larger molecules. Because reverse osmosis does not eliminate smaller molecules, we have designed our system to be a multi-filtration unit. The multi-filtration design allows our system to remove contaminants with physical obstruction and chemical absorption. Chemical absorption is the single most effective means of removing contaminants because it forces contaminants to break their bond with water and adhere to the filter instead. Filters or a combination of filters, that combine these two processes are the single most effective means of purifying water. Filtrations systems that use these processes remove chlorine, volatile organic compounds, and chlorine resistant bacteria.